COnnor Scott went 3-for-5 with a double, an RBI, a run scored, and two stolen bases in a LumberKings win on Saturday night in Beloit. 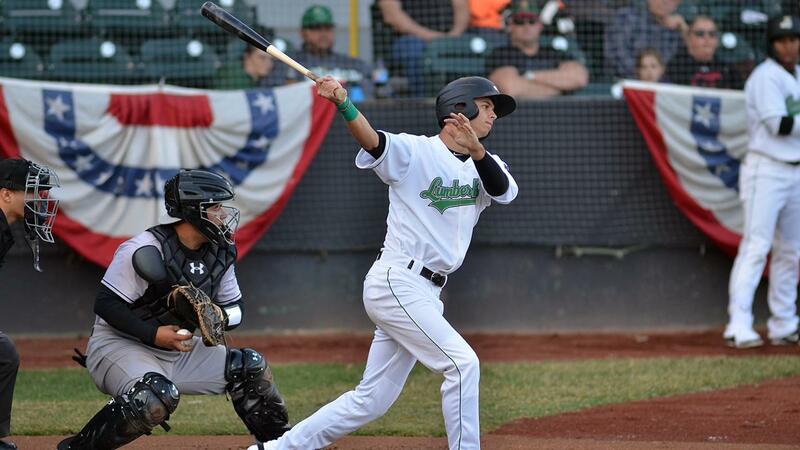 BELOIT, WI (April 13, 2019) - Connor Scott registered three hits for the Clinton LumberKings in a come from behind 7-6 10-inning win over the Beloit Snappers on Saturday night. Clinton (4-5) trailed by as much as four runs in the game but rallied late to capture their first series win of the season. The LumberKings fell behind early allowing the Snappers (4-6) to jump out with a two-run, two-out, single from Nick Osborne. The two-run deficit was chipped into right away in the top of the second inning. Marcos Rivera got the scoring started for Clinton with an opposite field solo home run to right that went for his first of the year. Beloit then seemed to pull away in the bottom of the fourth. In LumberKings starter Peyton Culbertson's last inning of work, he walked three men in the inning to set the table for a three-run Snappers rally. Two of the runs came in as unearned on a dropped fly ball by Connor Scott in center field. The runs would be the last of the game for Beloit until the 10th. The LumberKings got one run back in the fifth. Scott reached on his second hit of the game, an infield single, and then stole second and third base. Two batters later, Jerar Encarnacion chased him home with an RBI single to left. Encarnacion pulled Clinton to within one two innings later in the seventh. With Christopher Torres at first, he slugged his second home run over the batter's eye in straight away center field to make it 5-4. The comeback was completed in the top of the eighth. Thomas Jones singled with one out and stole second to move into scoring position. Scott then roped a double to right, his third hit of the game, to bring home Jones and tie the score at five. Alex Vesia (1-0) kept the game tied with two shutout innings of relief and earned the win for his work. He kept the Snappers scoreless in the eighth and ninth inning without allowing a hit and striking out two. In the top of the tenth the LumberKings cashed on the free base runner at second (part of Minor League Baseball's extra inning rules) and added an insurance run on a Thomas Jones single off Charlie Carney (0-1), his second hit of the game. Steven Farnworth closed out the win with his second save of the year in as many nights. He allowed the free base runner to score but retired Logan Farrar with the tying run at second to preserve the 7-6 win. The LumberKings will meet the Beloit Snappers for finale of their three-game series on Sunday night. Clinton will throw right-handed pitcher Alberto Guerrero (0-0, 9.00) while Beloit will counter with righty Chase Cohen (1-1, 1.93). Fans looking to listen to the game can hear Erik Oas on the call at 100.3 FM WCCI and online at lumberkings.com via the tunein radio ap at 1:45 p.m. with the pregame show.